Hundreds of people dressed as Father Christmas have taken part in an annual Santa Dash, raising thousands of pounds for Isle of Man charities. 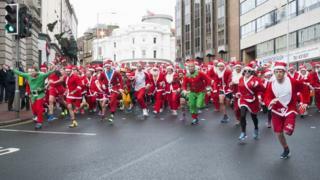 Jack Okell beat more than 200 other Santas to retain his title for the one-mile (1.6km) race around Douglas. He edged out Jamie Newton in a sprint finish, while Rachel Franklin won the women's race and came fourth overall. The event was first held in 2001, when only 10 Santas took part, and raised tens of thousands for charities. Organiser Deniese Smith said it was "brilliant to see so many people turning out and spreading some festive cheer".